Although I've never been to St. Petersburg, I can attest to the fact that feeding pelicans up close is a bad idea. I've been very close to California Browns and witnessed the hook at the end of those beaks. A very formadable weapon and one that just may take a finger if provoked. That being said, I've sat close enough, on the same bench as the bird, to take some pretty close shots of that aforementioned beak and its connected head. Do not follow my example. There's no postmark on this postcard, but I would guess, due to it being a linen card and the men's fashion sense, that this postcard is from between the late 1940's to the early 1950's. 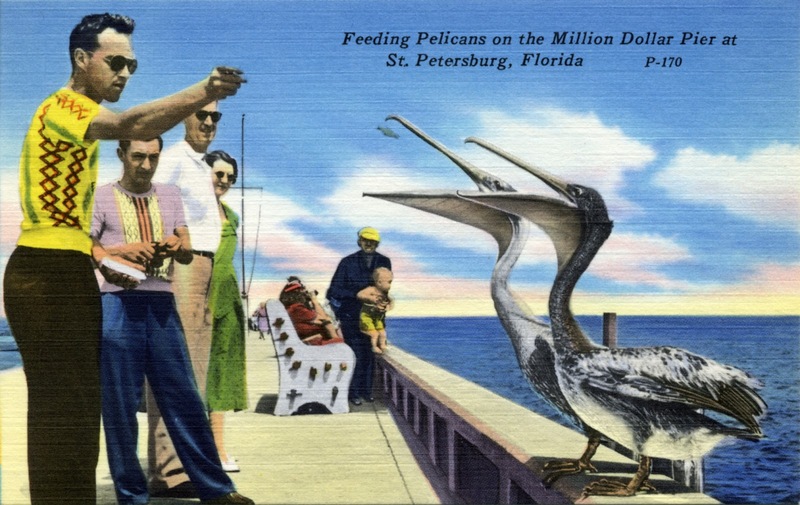 The back of the card reads: The pelican is one of the strangest and most amusing birds of the South. Their large pouch-like underbill can hold enormous quantities of food and feeding them is a very popular pastime at St. Petersburg, Florida.